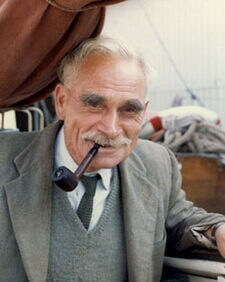 Bill Tilman was involved in two of the 1930s Mount Everest expeditions - participating in the 1935 Reconnaissance Expedition, and reaching 8290 meters without oxygen as the expedition leader in 1938. He penetrated the Nanda Devi sanctuary with Eric Shipton in 1934, and in 1936 he went on to lead an Anglo-American expedition to Nanda Devi. With the support of a team which included Peter Lloyd and H. Adams Carter, Tilman and Noel Odell succeeded in making the first ascent of the mountain, which remained the highest summit climbed by man until 1950. In 1939, Tilman was the first man to attempt climbing in the remote and unexplored Assam Himalaya, exploring the Southern approaches of Gori Chen, 6538 meters, before his team succumbed to malaria. In 1947 he attempted Rakaposhi, then made his way to Kashgar to join up with Eric Shipton in a lightweight attempt on Muztagh Ata, 7546 meters, which nearly succeeded. On his way back to India, he detoured through Afghanistan's Wakhan Corridor to see the source of the river Oxus. During his extensive exploration of the areas of Langtang, Ganesh and Manang in Nepal in 1949, Tilman was the first to ascend Paldor, 5896 meters, and found the pass named after him beyond Ganchenpo. In October/November 2010 we managed to to find Tilman's Pass, cross it from south to north, descend into the Langtang Valley and return via the Ganja-La, where we climbed Naya Kanga (formerly known as Ganja-La Chuli). We seem to be the only people who crossed the remote Tilman's Pass in 2010. En route we got lost several times and we had to establish a new route to the pass, because the maps we had were highly inaccurate. This website provides valuable information for anyone who wants to cross Tilman's Pass and (to a lesser extent) climb Naya Kanga. Please use the tabs above and below to navigate through the pages. Interested in our previous expeditions? In 2004 Antonio summited Aconcagua and in 2005 Marja and Otto summited Elbrus. In 2009 the 3 of us attempted Baruntse, Antonio succeeded again! This is the weather forecast for Gosainkund, in the middle of the Langtang region at approximately 4300 m.